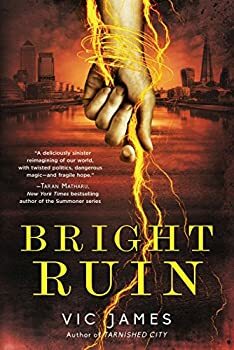 Vic James wraps up her hard-hitting DARK GIFTS fantasy trilogy with Bright Ruin (2018), which picks up right where the second book, Tarnished City, left off. This series is set an alternative version of our world where a minority, called the “Equals,” has powerful magical gifts. What they are supposed to be “equal” to is a good question, since ― in England and several other countries ― they have used their powers to cruelly oppress the non-magical majority. Among other abuses, all “Skilless” are forced to spend ten years of their lives as slaves. Initially, the Skilless Hadley family, including older teens Abigail (Abi) and Luke, were planning to spend their slavedays in what they hoped would be relative ease, serving the powerful Jardine family. Their plans, predictably, fell into ruins, and the Hadleys have been scattered about Great Britain. As Bright Ruin begins, Abi has barely escaped death in the Blood Fair, an old public execution tradition that has been unearthed by the Jardines. Luke, for his part, barely escaped death in the isolated Scottish castle of Lord Crovan, perhaps the most sadistic of the Equals, who delights in mental torture. Abi and Luke are now racing around England in different directions, each pursing their own part of the uprising against the tyranny of the Equals. Abi is supporting the main rebel group, which has support from a few Equals who have a conscience. Gavar, the oldest Jardine brother, has rather surprisingly thrown his support behind the rebellion, along with Midsummer, a young Equal woman with a pregnant unSkilled girlfriend, who has the power to bring stone statues to life. Abi’s goals begin to diverge from those of the rebellion leadership, as she concludes that a particular violent act may be the only way to effectively disrupt the rule of the Equals. Meanwhile, Luke has fallen in with the enigmatic Equal Silyen, the youngest Jardine brother, whose main value in life is gaining knowledge, at almost any cost. Silyen is also interested in Luke on a personal, romantic level, but right now Luke is preoccupied with trying to rescue a friend from a Crovan’s castle of torture. To gain Silyen’s help with his quest, Luke promises to help Silyen find out more about the ancient, mythical Wonder King, a mysterious, near-forgotten figure who inexplicably still seems to be influencing Great Britain. Vic James constantly surprises in the DARK GIFTS trilogy. The death toll is high, and nobody ― even main characters ― is safe. People develop and change, disclosing previously unsuspected facets of their personalities, or hidden agendas. Is Gavar trustworthy? Is the Speaker’s son, Jon, nurturing a relationship with Bouda Jardine to help the rebellion, or is he a hidden traitor? Is Silyen’s thirst for knowledge leading him to work for good or evil? There are nuances to the characters of people that make them multi-layered and unpredictable, and deceptions abound. Power corrupts, but sometimes the desire for power is just as soul-crushing. The mystical Wundorcyning (Wonder King) provides a kind of Beowulf-flavored interlude that tickled my fancy. His scenes felt somewhat random at the time, but provide a key to the ultimate resolution of the story. There’s an odd element to it, though, involving death and its relationship to power, that challenged my ability to suspend disbelief. The ending of Bright Ruin, though exciting, leaves many loose ends and questions about the future of some key characters, not to mention Britain itself and even the world. While on the one hand that treatment is realistic, at the same time I was yearning for more explication, perhaps another scene or two to give a better sense of closure. Perhaps there might be future novels from James set in this world. One can hope! I recommend the DARK GIFTS trilogy for fans of contemporary fantasy with a darker, dystopian edge to it, and who appreciate political machinations, social commentary, and unpredictable, well-drawn characters. 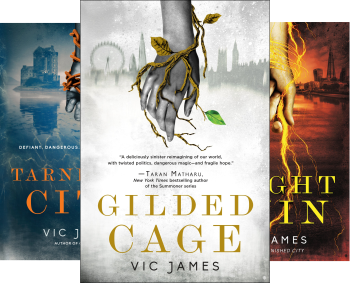 Tadiana’s done a wonderful job of recapping both Vic James’ DARK GIFTS series and Bright Ruin itself, so I’ll just take a little time to discuss my reaction (overwhelmingly positive) and thoughts (more, please!). It’s fascinating to me that James makes her bread-and-butter in television, because at no point has her prose read that way. Her characters grow and evolve (or don’t, as is appropriate) in measured and credible steps, her plots have realistic setbacks and victories, and she has an excellent ear for dialogue. It’s not as though Abi and Luke begin a revolution, build a support base, and then take down an oppressive regime over the course of a few months, much to my relief; a resistance has been building and striking out against the Equals for some time now, and the two oldest Hadley children join up and play their parts in its activities, but I appreciated that James didn’t make them the only important figures. Even the series’ antagonists, like Bouda Matravers, have a depth to them that is unexpected but welcome. I’ve thought since the beginning of the series that James’ character work and interweaving of alternate history are superb, and Bright Ruin didn’t let me down on either front. Could there ever have been an England in which Elizabeth was admired as a strong an independent ruler? In which Henry V was the daring hero of Agincourt, and not a cocky dunce? It didn’t seem likely, but then this book had been written in a country that had known three centuries of Equal rule. Who knew how these feckless monarchs had really lived? The only aspect of Bright Ruin which left me wanting was the conclusion: I’m not sure whether James intends to leave readers guessing about the fates of a few key characters, or whether she’ll return to this world in future works, closing those loops and resolving their fates for certain. I sincerely hope she’ll come back to this world at some point, if only to examine the consequences of the actions taken by Luke, Abi, Silyen and Gavar Jardine, among many others. It would be a refreshing change of pace for a YA dystopia author to create a world ripe for revolution and then take a hard, honest look at the costs and benefits of the changes wrought by that struggle — not just in the immediate aftermath, but in the months and years to follow. If I were to come up with a list of authors who I’d like to see tackle that subject matter, Vic James would be at the top. Overall, highly recommended. Published in October 2018. As the dystopian trilogy that began with Gilded Cage and Tarnished City concludes, the people of Britain rise up against their magically gifted masters. They must break the system—or be broken. MAGIC RUINS. WE RISE. The rules are simple, the system cruel: the lower classes must give ten years in service to Britain’s powerfully gifted rulers. With one uprising crushed by the glittering elite, commoners and aristocrats alike now take sides for a final confrontation. At the center of it all are two ordinary siblings: Abi Hadley and her brother, Luke. Each has reason to hate the ruling Jardine family. Abi, who was once their servant, now seeks revenge for a terrible wrong. Luke was imprisoned on their whim—but his only hope may be an alliance with the youngest and most powerful of the clan, the cold and inscrutable Silyen Jardine. Risking everything to end a bright and shining tyranny, Abi, Luke, and Silyen find themselves bound by a single destiny. Their actions will change their fates—and change the world. But at a cost almost too terrible to contemplate. What price would you pay for freedom? I am VERY interested in hearing your thoughts, Jana! I was wondering if you were reading this. They sound a little disturbing. It’s on an older YA level, so the punches are pulled somewhat. But yes, there is some disturbing content in this series. That’s not a deal-breaker for me — I mean, I read horror. I just noticed. I think for older teens that wouldn’t be a problem. I’m reading Gilded Cage and am so excited to get to the other two! Great story and characters! The second and third books were not a let-down, so I think you’ll really enjoy them! Have fun reading!